Abel Grimmer’s ‘The Proverbs: the true portrait of the abuses of the world’ which will be offered in Alcala Subastas’s upcoming sale in Madrid. As part of their auction series in Madrid on 21-22 March, Alcala Subastas will offer a 2ft 6in x 3ft 8in (78cm x 1.1m) oil titled The Proverbs: the true portrait of the abuses of the world. The painting is estimated to sell for €62,000. 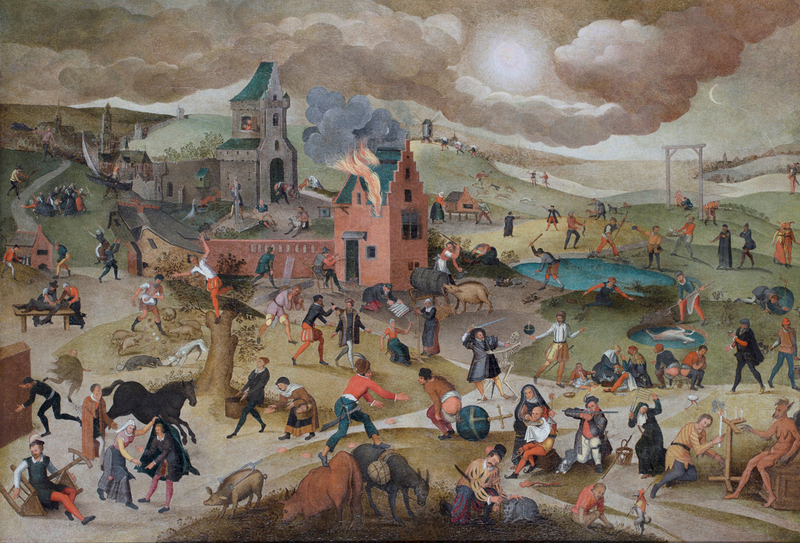 Reine de Bertier de Sauvigny, who wrote the catalogue raisonné on Jacob and Abel Grimmer, has commented on the great pictorial quality of this canvas which closely follows the composition of a 1558 engraving by Franz Hogenber, Die blau huicke is dit meest ghenaemt. It is interesting to note that Grimmer introduced his own variations to the scene. Near the foreground on the right, for example, is a character kneeling on the ground and pointing his crossbow to the viewer, to whom the warnings are directed, adding poignancy to the proverbs. There is also a knight fighting a skeleton of death, which is taken from an engraving by Hans Holbein the Younger. ‘The Virgin of Hope’ by Juan de Juanes to be offered for sale by Subastas Segre on March 20. 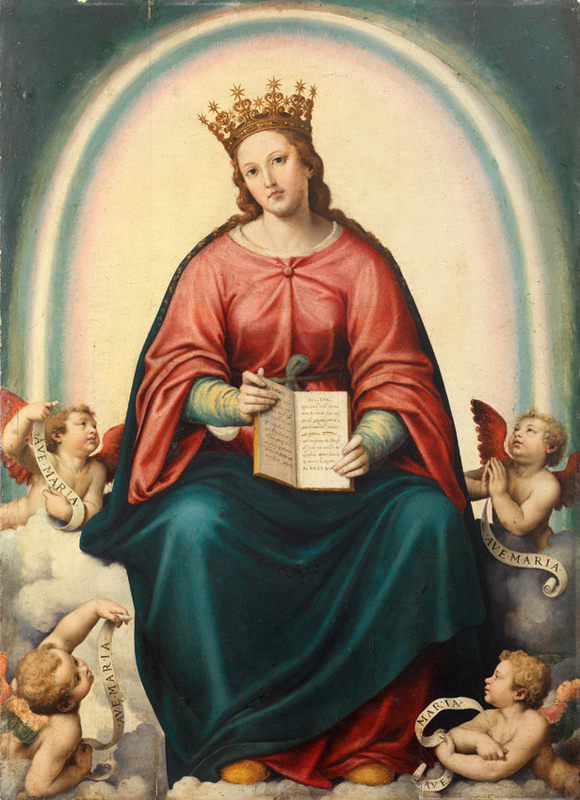 Meanwhile, on March 20, fellow Madrid saleroom Subastas Segre are to offer a painting by one of the most important artists of the Spanish Renaissance, Juan de Juanes (c1507-1579), titled Virgen de la Esperanza, or Virgin of Hope. This Marian representation by the artist bears great resemblance to a drawing in the Prado Museum. Juan de Juanes’ work shows Flemish influence, but also reflects the impact of the Italian painting of the Cinquecento and in particular that of Sebastiano del Piombo whose works were brought to Valencia by Jerónimo Vich, ambassador in Rome until 1521. It is believed the artist also closely studied the works of Raphael through prints. The use of colour is rich and bright and the painting’s quality and state of preservation make it one of the most important works of the Valencian master to have appeared on the market in recent years. The oil on panel measures 2ft 11in x 2ft 2in (65 x 90cm) and is estimated to sell for €100,000.